If as a kid (or maybe even as an adult) you remember fondly making your toys live out in your imagination epic battles across the bedroom floor or all over the backyard, you'll love the videos of Taiwanese stop-motion animator John Huang (aka Counter656). 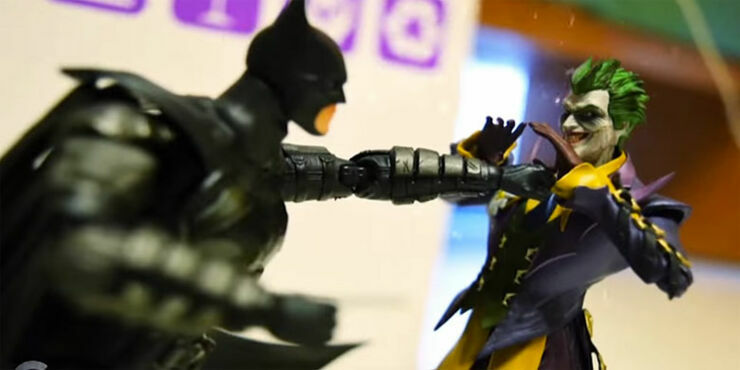 Huang uses toys to create brilliant stop-motions and his latest is a dramatic fight between Batman and his foe-of-foes, the Joker. The battle takes in all kinds of weapons from a crowbar to guns to, erm, those wind up chattering teeth. And, of course, Batman's usual wonderful toys. But just when victory looks certain for the Dark Knight, the Joker calls out his reinforcements—machine-gun toting Mechas. But Batman calls on some back up too, in the form of a certain Captain. And good triumphs over evil in toyland and we can all rest easy. Huang says the video took 20 days and about 3,500 pictures to make. You can check out more of his amazing stop-motion work on YouTube.